In July of 2017 I set out on a new journey into health. It was shortly after my good friend David of Fauxmage Vegan Cheese Co. moved to town. He wanted to start working out again and I was lead to do the same but not for the traditional reasons. I was simply tired of people not taking me seriously when I talked about protein and the benefits of my Plant-Powered Smoothie. 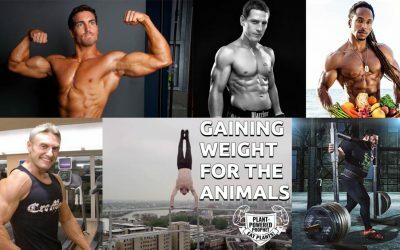 I wanted to make gains for the animals so I could make a greater impact on the planet. What ensued was beyond my wildest imagination. The lbs of muscle simply grew almost over night. Since beginning I have been adding nearly 1lb of muscle a week for months now and I do not see an end in sight. You can read my blog post updates where I show all of the miraculous results. I experienced a noticeable drop in happiness when I missed a regular workout in early October. I do not plan on doing that again. My arms, legs and chest are so much more defined. One does not need excess food to make gains! Body building or getting in shape can be very sustainable. It is still very hard work when you are working out but overall, this is a million times easier than I would have ever imagined. Keeping to a schedule is KEY!